If you're not me, you're probably not on summer vacation. So you're probably bummed that the long weekend is over. You're definitely bummed that the next one isn't until Labor Day and that feels forever away. Spirit Family Reunion -- I feel like I've written about them somewhere, but perhaps I didn't tag the post. This Brooklyn quartet is phenomenal -- I dare you to find another folk band that can get random passers-by in Bryant Park (tired from a long day of work) to stop, clap, dance, and sing. They're the real deal and their love for what they do is obvious. Langhorne Slim -- I absolutely adore The Way We Move. I'm pretty sure at least a tenth of the Spotify royalties for this album are from my repeated listens. I keep passing up opportunities to see Langhorne Slim play live. I'm excited that it'll be at a venue like this. Amy Helm and the Handsome Strangers -- If the name "Helm" tickles something in the back of your brain, it's because Amy is Levon Helm's daughter. She was one of the co-conpsirators behind Ollabelle, the band that brought folk and bluegrass to Brooklyn. Delta Spirit -- I think these guys might have sent me a demo once upon a time and I was like "ugh. Hipsters." But I caught the tail end of one of their sets at Rockwood Music Hall and realized they're not playing strident blues rock because it's a fad. Oh, and did I mention that the festival is basically supposed to be like camp, but awesome? In between sets, you can play laser tag (which is where you'll find me), go swimming, play pick-up basketball or soccer, or play on the adult-sized water obstacle course out on the lake. 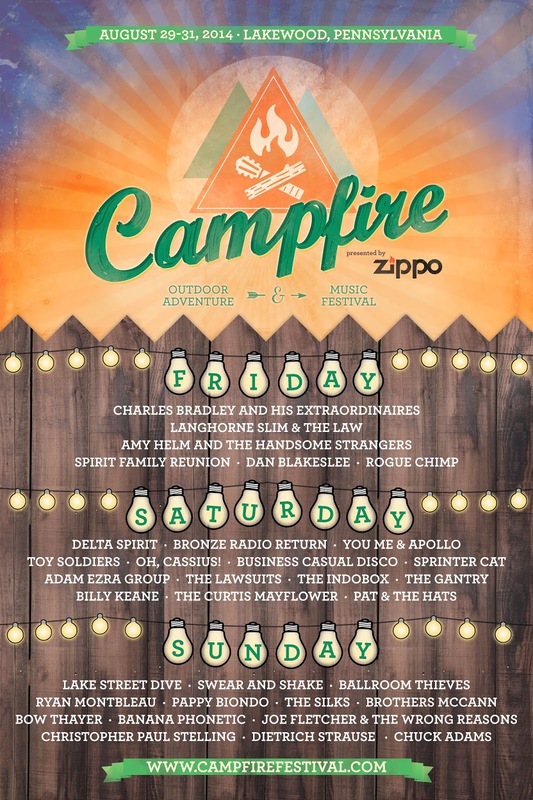 For more information about the Campfire Outdoor Festival, click here.